Get Thee Down short story illustration. Charcoal drawing by author. 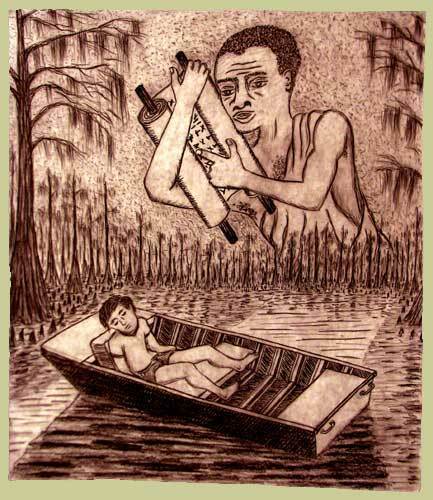 The boy has fallen asleep in a john boat floating on a lake somewhere between Natchez and Baton Rouge. The lake is shallow for the most part, but it is wide, wider than most bayous, and its waters back up into the stands of cypress trees that surround it. Millions of frogs up in the shallows are chirping and buzzing in a white noise that covers up everything but the roars of the bullfrogs. The bullfrogs bellow out randomly and out of turn, and it gives the chorus some sort of strange pre-human rhythm. Over the years, maybe every couple of years or so, the boy would have the dream again. The dream wouldn’t always be exactly the same, and sometimes it would be mixed in with other dreams, but the loud voice would always be obscured by the sound of the frogs. No matter how hard the boy concentrated, he couldn’t make out the words. Get thee down to Egypt and tell Pharaoh his arrogance is an outrage. He puffs himself up as the Lord’s anointed, and the bleating sheep follow. Would the Lord need this many lies to do anything? Tell Saul his days are numbered.